"This recipe if from the l930's. My Grandmother gave it to my Mother and she gave it to me. Now I am a grandmother and passed it down to my kids. It's really good. You don't have to dirty your mixer for this one, just a big bowl." Preheat oven to 350 degrees F (175 degrees C) grease and flour a 9x13 inch pan. In a saucepan mix brown sugar, raisins, water and shortening. Bring to a boil and boil 3 minutes. Remove from heat and let cool. In a large bowl, combine flour, baking soda, salt, cinnamon, nutmeg and cloves. When raisin mixture is cool, add to dry ingredients and mix well to combine. Bake at 350 degrees F (175 degrees C) for 30 or 40 minutes. Do not over bake or it will be too dry. Test after 30 minutes. A toothpick inserted into the center of cake should come out clean. 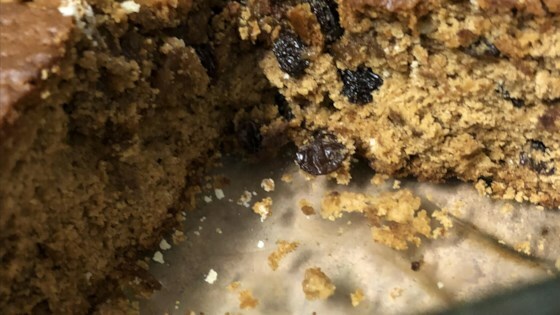 I have made other variations of Poor Mans Cake- this one turned out rather dry - Neither my housband or I were happy with it.If your're looking for a recipe for this cake try one of the others.